The lawyers said prosecutors have not proved the charges over the course of the 10-week federal corruption case and leaned on the testimony of restaurateur Harendra Singh. 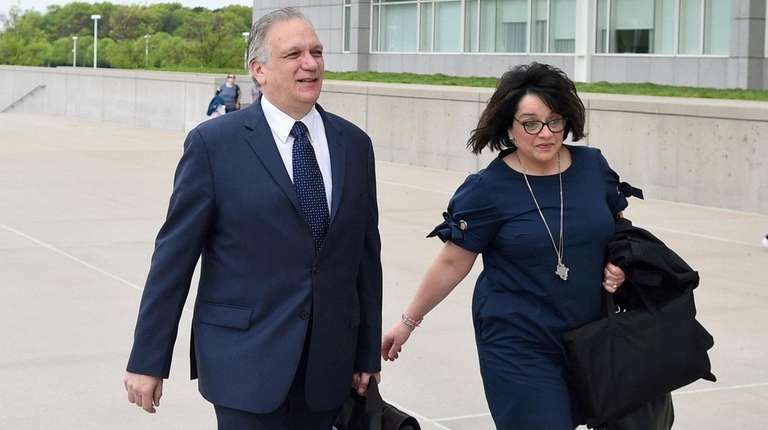 Defense attorneys for former Nassau County Executive Edward Mangano, his wife, Linda, and former Oyster Bay Town Supervisor John Venditto on Wednesday portrayed the prosecutors’ star witness as a liar and criminal who is looking to escape time behind bars. The lawyers during their closing arguments said prosecutors had not proved their charges over the course of the 10-week federal corruption trial and depended on the testimony of restaurateur Harendra Singh. Venditto’s defense attorney, Marc Agnifilo of Manhattan, offered perhaps the harshest assessment of Singh’s character. “Harendra Singh is a sociopath and nobody in the Town of Oyster Bay saw him coming,” Agnifilo said. Singh, whose testimony dominated the first four weeks of the trial in Central Islip, said that he bribed Edward Mangano and Venditto in exchange for two county contracts and more than $20 million in town-guaranteed loans. The defense attorney argued that it was, in fact, former Oyster Bay deputy town attorney Frederick Mei who maintained a “corrupt relationship” with Singh and Mei’s allegiance was to the restaurateur, not to the town. Mei pleaded guilty to taking bribes from Singh and testified earlier in the trial as a prosecution witness. Edward Mangano, 56, of Bethpage, and Venditto, 68, of North Massapequa, face charges that include conspiracy to commit federal program bribery and honest-services wire fraud, extortion for Mangano and securities fraud for Venditto. On Wednesday, Carman, Linda Mangano’s attorney, indicated that his client had been at a distinct disadvantage in her interviews with FBI special agent Laura Spence, who testified that Mangano lied in the exchanges concerning what prosecutors say was her no-show job with Singh. Carman noted the agents who interviewed Mangano made no verbatim notes. He said Spence, who he noted has a master’s degree in forensic psychology, testified while using as a “memory aid” the government’s list of Mangano’s alleged false statements. Agnifilo, who made his closing argument after Carman finished his Wednesday, focused at one point to the pivotal April 28, 2010 meeting of county and town officials and outside attorneys at Venditto’s campaign headquarters in North Massapequa. Witnesses testified that the group gathered to discuss how to guarantee loans for Singh. Agnifilo noted that Oyster Bay’s outside counsel, Jonathan Sinnreich, was in attendance, though he had opposed using the town’s creditworthiness to secure loans for Singh. Agnifilo then addressed the town-guaranteed loans for Singh at the heart of prosecutors’ case. Agnifilo said paperwork for $3.4 million for improvements at the Woodlands catering hall on the town-owned golf course in Woodbury, where Singh was a concessionaire, bore a forged Venditto signature. The supervisor has signed off on a $2 million agreement, but the loan amount was changed to $3.4 million when Mei amended it without Venditto’s knowledge, Agnifilo said. Mei’s action wasn’t discovered until it came out at trial, Agnifilo said. Before then, prosecutors had accused Venditto of signing off on the $3.4 million loan, Agnifilo said. “John Venditto did not know that Fred Mei and Harendra Singh committed forgery of this document,” Agnifilo said. The town supervisor also didn’t know about the two final NDH Capital Corp. loans for Singh, Agnifilo said. Former deputy town supervisor Leonard Genova, who has immunity and testified for the prosecution, told the jury he signed the agreements without reading them. The only unaltered loan agreement that Venditto signed was the first one in 2010 for a $1.5 million line of credit, and it was paid off by the second loan, Agnifilo said. The defense attorney concluded that there’s no proof that Venditto was aware of any improper loan agreement. Agnifilo’s closing argument is expected to continue Thursday. Assistant U.S. Attorney Catherine Mirabile is expected to give a rebuttal argument, U.S. District Court Judge Joan M. Azrack is expected to give jurors instructions and then they are set to begin deliberating. Who’s who in the trialKey figures in the ongoing political corruption trial of former Nassau County Executive Edward Mangano, his wife, Linda, and former Town of Oyster Bay Supervisor John Venditto. 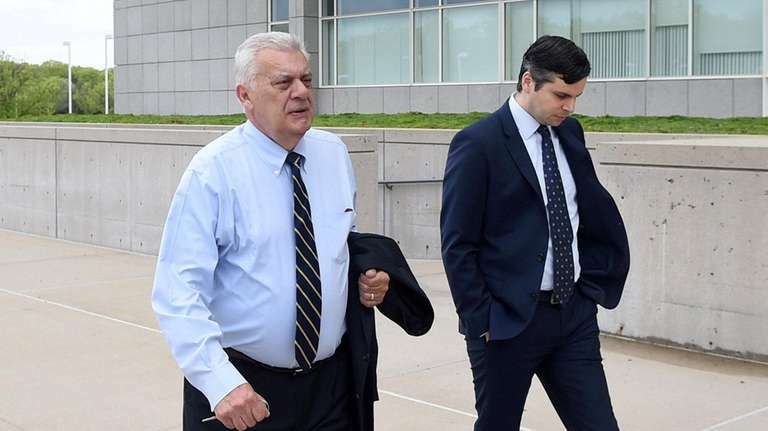 Feds: Mangano, Venditto ‘traded their office’ for moneyFormer Nassau County Executive Edward Mangano and former Oyster Bay Town Supervisor John Venditto "traded their office for money, plain and simple," a federal prosecutor stated in closing arguments. Power on Trial: Closing argumentsNeither snow nor sickness . . . At 9:25 a.m. Tuesday, U.S. District Judge Joan ... Analyst: Town withheld info on Singh’s loansPatrick Strollo of Federated Investors said town officials didn't tell him that more than $20 million in loans for the restaurateur were guaranteed -- until after Strollo's firm purchased about $186 million in securities.